A research initiative at Stanford University, Data Wrangler.. Wonderfully helping for analysts. Recently one of my projects moved to exadata device. There was so much talk around that, the queries and db processes need not be looked into, exadata will take care of them already. However, two things happened.. first, there was a technical talk on the device's configuration. The device turned out to be a mammoth piece of hardware. In nutshell, its a 8 node cluster, each node having 4 cpu's. Each CPU has around 2-4 GB of RAM. Then there is this high speed secondary storage which can hold a lot of cache. The nodes are interconnected using a special switch which can transfer data faster than Gigabit networks. With such hardware configuration, any software can claim the kind of performance gain they claim. Not to undermine the performance gains, I just want to say that the hype around the out of the world performance gains, is actually the result of better hardware, not really revolutionary software. I, personally was expecting something of that type from Oracle, since they lack in that area. Except Teradata, there is almost no player who delivers that kind of Data Warehouse architecture and performance. and I was hoping that Oracle would do something around there and bring out something. And, the second thing, one of the processes tried to load data to an exadata instance using informatica. Initially we left things at default so that exadata can tune it itself and we should not force anything. However, there too, exadata failed big time and couldnt put in any perf gain. At the end, all the tuning had to be done by us only. So, the other claim of exadata regarding intelligence to pick up processes and fix them on its own also went down for us. The wavy Tricolor, originally uploaded by s_raghu20. 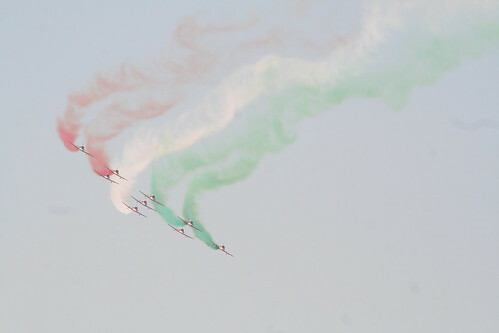 This was captured at the Aero India 2011, the bi-annual air show held in Bangalore. It was my first ever attempt to watch and shoot these metal birds. I have realized that the sharpness of some of the shots is less than ideal, perhaps a function of their speeds and movement. Also a function of my reflexes and my equipment.